In a large heavy bottom pot, heat grapeseed oil over medium-high heat. Season pork with salt and pepper and sear on all sides. 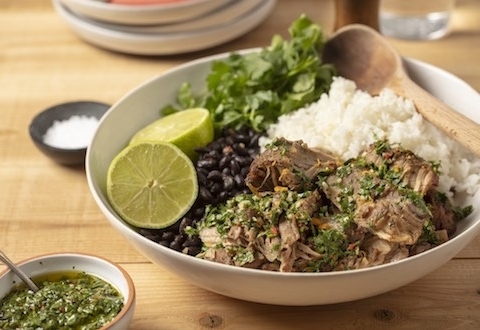 Place seared pork shoulder in slow cooker. Pour off the extra fat and oil from the heavy bottom pot and discard. To the pot, add onion, Fresno pepper and rum; bring to a simmer and scrape up all the bits from the bottom of the pot. Add the rum mixture to the slow cooker. Next, to the slow cooker add orange juice, lime juice, garlic, cumin, oregano, red pepper flakes and coriander. Cover and cook for 6 hours on high. Remove roast to a serving plate and top with chimichurri sauce to serve. Mix all ingredients together and serve immediately over pork.